Sleek Matte Me Browns Goes Natural to Fierce! I know it's the start of a new year and I told myself to wear more colored lip products more often! As much as I've been trying my best, I can't keep my hands away from browns when I saw the newest Matte Me Browns from Sleek MakeUP. In a way, some shades are super nice for daily use for the others are meant for special occasions. Remember the movie The Craft? Well, the 2 darkest shades reminded me on that! But it's just because I am so fair the dark brown appears super distinct! Are you ready to see the 4 new Matte Me Brown shades I got? At a Glance, the top 2 shades are perfect for day time use while the bottom 2 are perfect for night out. Housed in the same packaging, you can see the color from the transparent plastic tube. They have the same pigmentation and quick-drying properties. These liquid matte lipsticks are meant to be applied in just a single stroke, a second application is NOT needed due to high pigmentation. That said, it is tricky to use for users with extremely dry lips like I do. But I mastered the art of hydrating my lips readying it for liquid matte lip products! Cinnamon spice is a gorgeous cool-tone medium brown shade that works for all complexion! Browns are like reds, it is hard to pull off if you have fair complexion as it can easily wash out the rest of your features. Not with this shade, it's a nice MLBB shade if you have pigmented lips. Roasted Almond is a medium brown shade with added reddish brown tint! This is like an equivalent of a reddish orange lipstick. As I can't wear reddish orange for the love of me, I find myself working on a reddish brown lip color! With the same camera setting for all photos, can you see how my face and hair is particularly highlighted? Hazelnuet Crush is a cool tone deep brown shade! It holds true to the brown color that I find this to be the perfect 90's look! For some reason, the higher pigmented lip colors from the Browns line are more drying (as expected as there are more pigments) so I actually top this with a lip balm to prevent lip drying and feathering. If you can melt a dark chocolate and put it on your lips, this is how it will look! A deep deep brown chocolate shade that would work for medium to darker complexion girls in my opinion. 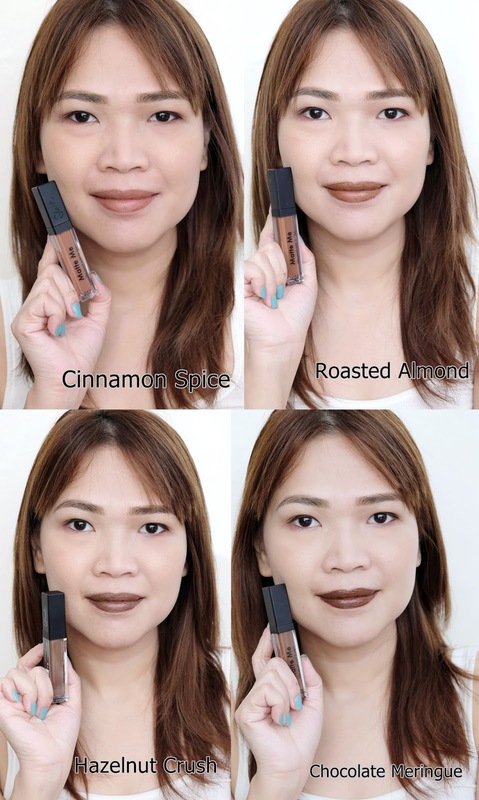 I can still wear this but in person it is a bit too dark for my personality (lol) so I guess I can mix this with a lip concealer to lighten up the color just so I won't shock my family and son away! What's your favorite Matte Me Browns? Matte me are priced at Php450.00 each. Bet ko Cinnamon Spice sayo! Hazelnut Crush reminds me of honeymoon glow from nyx. Sleek Matte Me always comes up with great shades. I like browns too, Cinnamon Spice appeals to me among the four shades and it looks good on you! Thanks for commenting and thanks for liking!